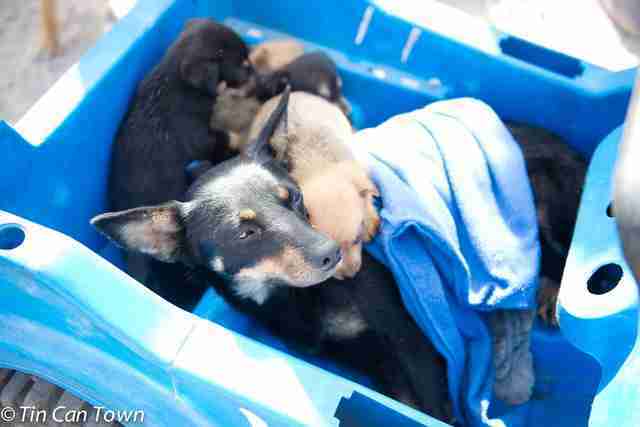 The woman was determined to get her dog — and her dog’s four new puppies — the vet care they needed. She didn’t have a vehicle to drive them anywhere, but she figured out a novel solution. 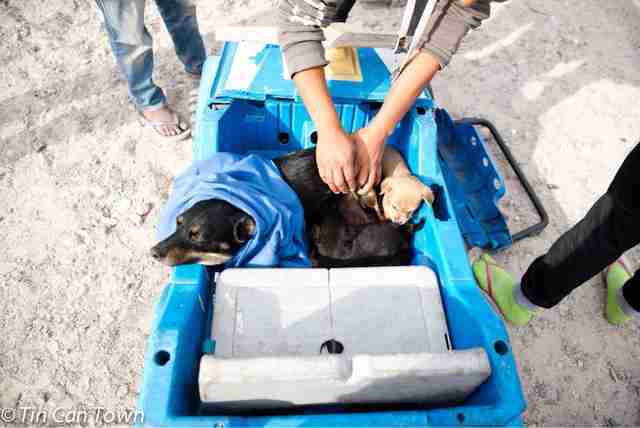 She loaded the dogs into a child’s toy jeep and pushed them in that. This woman lived in Blikkiesdorp, a camp in Cape Town, South Africa, where some of the country’s poorest people live. In Blikkiesdorp, people live in tiny shacks made out of iron sheets, wood pieces and old tires. The roads are dusty and unpaved, and several families have to share basic amenities like kitchen sinks and toilets. Gang violence is prevalent, making Blikkiesdorp one of the most dangerous places in Cape Town. It’s not just people who find it tough living in Blikkiesdorp — animals suffer here too. Dogs and cats often don’t get enough to eat, even when they’re owned by people — and lots of the locals don’t understand the importance of getting their pets basic vet care, or can't afford to take them. 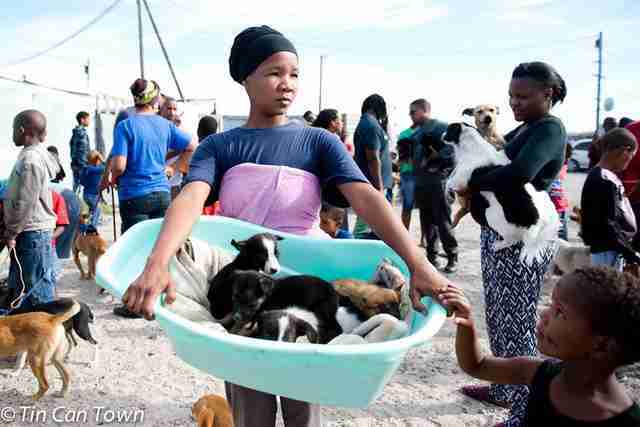 Six years ago, a group of animal lovers started Tin Can Town, an organization that offers humane, lifesaving animal services to the dogs and cats living in Blikkiesdorp. 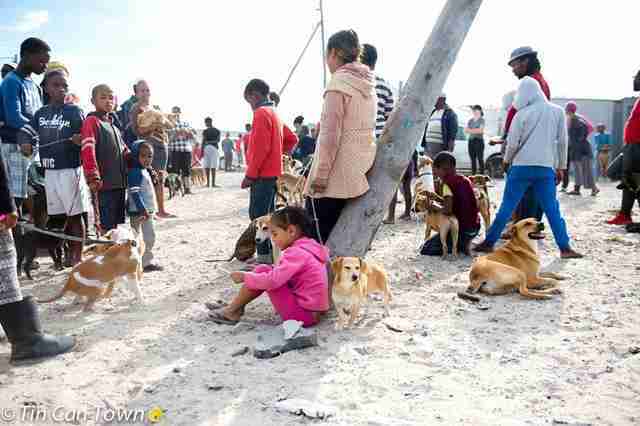 Every other Sunday, volunteers go into Blikkiesdorp to neuter and spay animals, give flea and deworming treatments and provide food. They're also on call 24 hours a day to help any animal in need, and take them to the emergency vet if necessary. 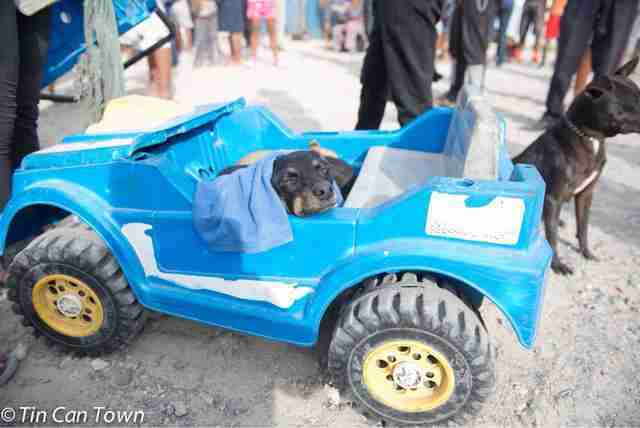 Last Sunday, Tarryn Martin, a volunteer photographer for Tin Can Town, met the woman with the dogs in the toy car — they were standing in line at Tin Can Town’s outreach table, waiting for the volunteers to look at her dog and puppies. It was a particularly hot day, and the woman had draped a towel over the mother dog, who was still nursing, to try and keep her cool. The wait was worth it. Once the woman got to the front of the line, volunteers examined the dog and puppies, and gave them basic veterinary care like deworming treatment and vaccinations. 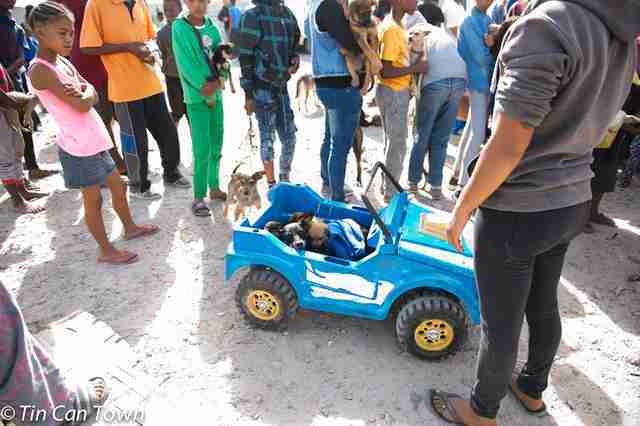 While the toy car was an amusing sight for everyone, Martin explained that it’s typical for people to transport their animals in these kinds of containers. 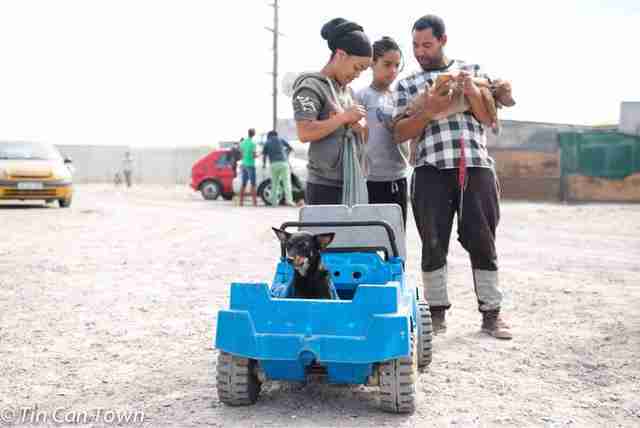 After getting their vet care, the woman walked back home, still pushing her dog and puppies in the toy jeep. 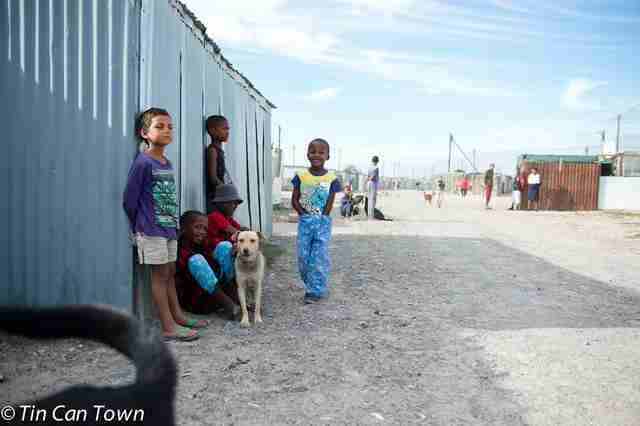 To help dogs and cats living in Blikkiesdorp in South Africa, you can make a donation to Tin Can Town.